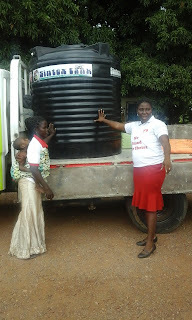 Other mothers with cerebral palsy children were all given a bag of rice and a bottle of oil as some form of support. Mrs Gloria Yeboah Botwe, Director of Women of Love Ministry who made the presentation at a ceremony in Dodowa, said children with cerebral palsy are also gift from God. Mrs Yeboah-Botwe said her organization is ready train mothers with cerebral palsy children in various vocational skills for free and also help them with startup capital to enable them earn a living and be able to take good care of their children. Ms Rosemary Ladzi, shaing her experience said she had been frustrated to the point of poisoning herself but she was thankful she did not die. Ms Agama on the other hand said her association with other mothers through the CBM, an international Christian Development organization has been very helpful. CBM, in collaboration with the International Centre for Evidence in Disability of the London School of Hygiene and Tropical Medicine and the University of Ghana (UG) initiated a research to evaluate the impact of a community –based parent training programme for children with Cerebral Palsy in Ghana. Mrs Jedidiah Abanga, Official of the Presbyterian Church Health directorate explained that the programme aims to increase knowledge and skills in caring for a child with cerebral palsy. Mr Anthony Adaboe, a Special Needs Educator and leader of one of such groups in Dodowa, said many of the mothers have expressed enormous benefits since the start of the project. As part of the project a group of health professionals including physiotherapists, nutritionists, pediatricians and other health officials visit the mothers at home periodically while monthly meetings are also help to teach the group. The project among other objectives is also exploring ways caregivers can be empowered and how it impacts upon care of their child.